When Operation Black Vote undertook its first political hustings meeting, there was only one place to go, Croydon. This was because the indefatigable, big hearted, ‘don’t mess with me’, Gee Bernard demanded we go there. It was 1997, John Major was in power, Tony Blair was about to succeed him, and we wanted, for the first time ever, to put Black political power firmly on the map. Croydon North was a marginal seat - as it is today, and Malcolm Wicks was the sitting MP. With the superb help of Gee Bernard that hustings meeting, with all the parliamentary candidates sweating under the media spotlight, had a profound effect on all of us - not least the way politicians would now view the Black vote. What happened that night was that for the first time in British history, candidates from all political parties publically fought over who would get the Black vote. As a young activist that meant a lot to me. At that moment we had been given the nod of approval from a fearless Black woman who had fought every battle that needed to be fought in that borough. Gee Bernard was the borough’s first black councillor, and if truth be known should have been its first Black leader too. 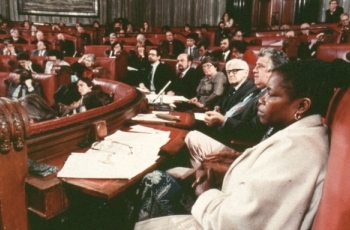 We can only imagine what it must have been like for her as the only Black person sitting in an elected chamber back then. But we must remember Bernard was more than a politician - she was a community leader. In the early 90's she had founded The Croydon African Caribbean Family Association (CACFO), which was her community platform to serve the borough's Black community. This was a woman who got things done. Of course when I heard the news that Gee Bernard had passed my heart sank. I hadn’t seen her for a number of years, but like many of you, I always expected her to be around. Sadly, she’s no longer here, but her legacy and the memory of a fearless, no nonsense campaigner lives on through the people she inspired and encouraged, including, I’m proud to say myself. Simon and all the family at OBV.